Set sail from Miami, Florida to Colombia, Panama Canal, Costa Rica, Mexico and Cailfornia aboard the award-winning Celebrity Constellation. 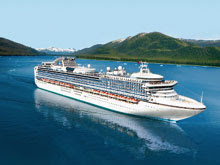 To book your Panama Canal Cruise go to http://cruisesalefinder.com.au. 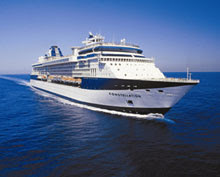 Celebrity Constellation is a Millennium class cruise ship of Celebrity Cruises. 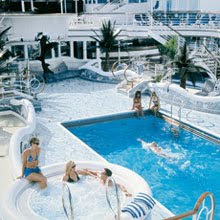 She is the co-flagship of the Celebrity fleet, along with Century-class ship Century. 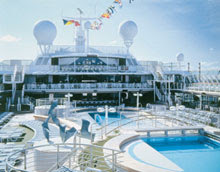 Her three sister ships are the Celebrity Infinity, Summit, and Millennium. Celebrity Constellation consistently receives top honors from Condé Nast's readers survey, and is currently ranked by readers as the best large cruise ship (source: Wikipedia). Cartagena, Colombia: Founded in 1533, Cartagena is the picture-perfect Spanish-colonial village. A fortress wall surrounds the historic village's pastel-colored architecture, quaint streets and fine cathedrals. Panama Canal (Cruising): For fifty miles the canal transects the exotic emerald jungles of Panama and gives one an appreciation of what a Herculean task it was to build this waterway before the advent of computers and giant earth movers. Puntarenas, Costa Rica: Located along the Pacific coast of Costa Rica, where the native wildlife ranges from macaws to jaguars. Puntarenas is a fishing port -- try the ceviche de corvine - fresh fish marinated in lime juice with onions, peppers and spices. Huatulco, Mexico: At the foot of the Sierra del Sur Mountains, Huatulco is actually made up of nine distinct bays. The turquoise waters are home to an abundance of sea life and provide a delightful aquatic playground for visitors. Acapulco, Mexico: World-famous beaches offer up the sun and surf for different agendas, whether you're in the mood for exhilaration of serenity. Cabo San Lucas, Mexico: This southernmost enclave on the tip of the Baja Peninsula features unearthly rock formations, cantinas owned by rock stars and hundreds of ways to enjoy yourself on, in, under and close to the water. San Diego, California: In addition to being home to a world-class zoo and aquarium, San Diego is a laid-back navy town that is the closest U.S. city to Mexico. 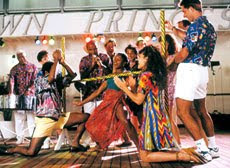 Sail from Tahiti to Florida aboard the Pacific Princess. This voyage, departing December 18 from Papeete in Tahiti, sails to Moorea, Bora Bora, Pitcairn, Easter Island, San Martin, Callao, Manta, Cristobal, San Blas, Limon and onto Fort Lauderdale, Florida. It's a great way to return to the USA after flying to Tahiti. Herman Melville was imprisoned in Papeete in 1842; his experiences there became the basis for the novel Omoo. Paul Gauguin journeyed to and toured Papeete in 1891 and, except for a two-year period in 1893–1895, never returned to France. Sail from Fremantle aboard the Sun Princess and marvel at the wonders of Australia on an amazing 17-night voyage, exploring the northern highlights of the continent. To book an Australia Cruise go to http://cruisesalefinder.com.au. From Fremantle the cruise goes north about 450km to the city of Geraldton, which has gorgeous coastline to the west and hills and ranges to the east. From there you'll take in Bali's Padang Bay before heading back to Australia and the town of Broome. Broome was founded as a pearling port over a century ago and as a result, has become a melting pot of many cultures. Then the voyage will take you to Darwin, Port Douglas, Townesville and Brisbane before you reluctantly disembark in Sydney. The 105-night voyage is the first ever westbound circumnavigation of the world from Australia. 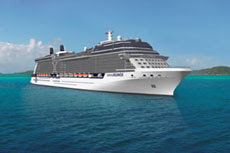 To catch the World Cruise Sale go quickly to http://cruisesalefinder.com.au. The Dawn Princess is departing May 21 2010, arriving in Europe in July at the height of the northern hemisphere summer. The voyage goes to Indonesia, Singapore, Malaysia, India and Dubai before passing through the Suez Canal to Egypt. The northbound trip stops in at 12 iconic Mediterranean destinations, including a cruise by ANZAC cove and a magical overnight stay in Venice before arriving in Southampton on 14th July 2010. The southbound leg visits Dublin before crossing the Atlantic to Boston and New York. Then it's the Caribbean leg of the itinerary -- visiting the famous cricketing islands of Barbados and Antigua before transiting the Panama Canal to Mexico and Los Angeles. The final Trans Pacific leg visits Hawaii, Tahiti and Auckland before returning to Sydney. Video: Evening footage from onboard the Dawn Princess as she passes under Sydney Harbour Bridge ... to the obvious enjoyment of the excited passengers. Set sail on a return voyage from Melbourne and visit one of the most celebrated countries in the world -- New Zealand. 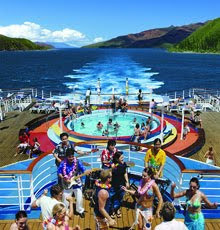 To book your New Zealand Cruise go to http://cruisesalefinder.com.au. New Zealand, known by local Maori as "Aotearoa", or the 'land of the long white cloud', has some pretty stunning sights to behold. This 13-night voyage on the luxurious Dawn Princess departs January 24 and heads straight for the south, starting at the South Island’s Fiordland National Park. Milford Sound is one New Zealand’s most famous tourist destinations -- you'll experience scenic cruising here and witness dramatic waterfalls, ancient rain forest, shimmering lakes and granite peaks before heading around the bottom of the South Island. There you'll discover the historic city of Dunedin, famous for its Victorian architecture and jangly pop music -- and home to penguins and seal colonies. Set sail from Fort Lauderdale, Florida, on your 11 night "Ultimate Caribbean Cruise" aboard Celebrity's Equinox. 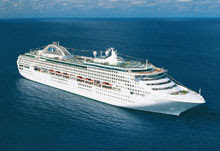 To book your Caribbean Cruise go to http://cruisesalefinder.co.nz. This great 12 day cruise visits six different ports of call and includes visits to Grand Cayman, Colombia, Panama, Honduras, and Mexico. Leaving Fort Lauderdale, Florida, Equinox heads to Cozumel and Costa Maya, Mexico. Then it's off to Roatan, Honduras, Colón, Panama; Cartagena, Colombia, George Town, Grand Cayman before returning to Fort Lauderdale, Florida. Onboard amenities include a large theater, multiple restaurant dining options including a dedicated restaurant for AquaClass guests, The Patio on the Lawn, numerous bars and clubs, Solstice Deck, youth facilities, Online@Celebrity, and many other common and unique features. Some new innovations that have been revealed include glass-blowing classes/demonstrations as well as The Lawn Club, a live grass lawn between the ship's funnels on the upper deck. The Dawn Princess departs May 21, 2010, six weeks earlier than the 2009 eastbound voyage. It will arrive in Europe in July at the height of the northern hemisphere summer. The cruise will visit Indonesia, Singapore, Malaysia, India and Dubai before passing through the Suez Canal to Egypt. Then it takes in 12 iconic Mediterranean destinations including a sail past ANZAC cove and an overnight stay in Venice, before arriving in Southampton on 14th July 2010. The southbound leg visits Dublin before crossing the Atlantic to Boston and New York. Then it's off to the Caribbean islands of Barbados and Antigua before heading through the Panama Canal to Mexico and Los Angeles, Hawaii, Tahiti and then onto Auckland. Take in an idyllic cruise on the Pacific Sun from Auckland with stops at five beautiful Pacific Island destinations, including Norfolk Island. On this cruise, departing Auckland March 24 2010, you can check out the white sand beaches of Mystery Island and Ouvea, the always busy Port Vila, and get a taste of France in Noumea. The cruise also visits Norfolk Island, which has been added to the P&O itinerary for the first time in 2010. Norfolk Island: Follow in the footsteps of Captain Cook and discover a beautiful, unspoiled landscape. Noumea: Colonial architecture and vibrant markets will draw you into Noumea's old-world values and continental culture. Ouvea: An exquisite coral atoll that boasts one of New Caledonia's finest beaches - a 25km strip of white sand fronting a turquoise lagoon. Vila: Friendly locals with welcoming smiles will introduce you to their island. Stop for traditional souvenirs, see the waterfalls or go snorkelling. You can even post a card from an underwater post office situated on a nearby island. Mystery Island: White beaches edged with coconut trees and crystal clear lagoons. Snorkel in colourful underwater gardens or chill out in a world that civilisation has left behind. 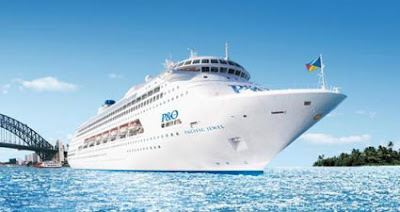 In December 2009, P&O Cruise ship Pacific Jewel will start sailing the seas around Australia. Her unique offerings include an incredible high-wire circus and trapeze arena on the top deck and the new Aqua Heath, Spa & Fitness Centre, decked out with treatment rooms boasting spectacular ocean views. Another first is a celebrity chef at sea with the new Salt Grill restaurant by celebrated chef Luke Mangan. Pacific Jewel will sail year round from Sydney to the South Pacific and New Zealand. Her maiden voyage to Tasmania in December 2009 will recreate history as she retraces the first ever cruise of the Australian mainland. With 11 decks, over 200 affordable balcony cabins and room for 1950 passengers, Pacific Jewel cruises are the holiday treat you've been waiting for. Formerly known as Ocean Village 2, Pacific Jewel has been in drydock undergoing a complete refit. Progress can be seen via the P&O Cruises Pacific Jewel blog.